Since so many people have taken to eating out at restaurants for their Thanksgiving meal, it’s no wonder that turkey has become a prime concern for restaurateurs and their chefs. They want to make sure they have the juiciest and best turkey, and of course, the most fool-proof methods of preparation available. 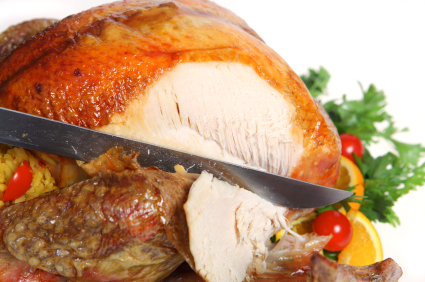 Here are a few important tips to prepare the star of any Thanksgiving meal. Turkeys are big, way too big to cook to perfection when they are large and whole. The white meat cooks faster than the dark meat and that often results in dry white turkey breast. All chefs agree that cutting up the turkey before roasting it is the best way to ensure that all parts of the bird are properly cooked. Some chefs roast their turkey whole until the breasts are done, and then cut off the legs and thighs and cook them separately. Others start with a cut up turkey. Either method will ensure that your white and dark meat are both cooked to perfection. As your turkey is cooked and carved, it will be important that the meat stays warm and moist. There's nothing worse than dry, cold turkey, so be sure that you have plenty of chicken stock on hand to add moisture and keep the turkey warm. Ladle some warm chicken stock on your turkey before it's served and you will please your customers. This tip also works well with stuffing. Chefs agree that brining turkey beforehand is a sure fire method of attaining the juiciest, and most flavorful turkey you can imagine. This has to be done a day before you plan on cooking it. A savory glaze can be made from any number of ingredients, and spread all around the turkey 45 minutes to an hour before it is ready. This method assures an absolutely flavorful turkey your customers won’t forget. Rather than roast your turkey breast, another cooking method is to poach the breast. This allows you to gently cook the breast, allowing it to retain more moisture. Since the dark meat takes longer to cook, you can simultaneously braise the turkey legs and thighs separately while roasting them, resulting in a delicious flavor. In this way you can satisfy both your white and dark meat lovers without sacrificing moisture and flavor. As a restaurateur you will want to get the most turkey for your money, but also the best. You may opt for fresh or frozen, but you will still need a lot of birds to go around. Frozen turkeys are blast frozen so quickly that many say that they are better than fresh turkeys. These need to be defrosted a few days before cooking and thawed properly. The choices among turkeys, whether fresh or frozen, are many. You can choose from organic; natural, minimally free-range, and kosher. Each of these has its pros and cons, as well as different cost criteria that requires further research for each particular restaurant. Proper thawing and brining is essential in ensuring that your Thanksgiving turkey comes out the best it can be. If you purchase turkey in bulk and they are frozen, be sure to prepare your walk-in refrigerator so that you have ample space for thawing the turkey. Most turkeys need up to four days to thaw in the fridge, so proper planning is essential. Then you'll need to cut up the turkey and plan how you will roast the parts. While it sounds good to stuff your turkey and then cook it, this makes the cooking process take much longer and may also result in bacterial growth. So most agree that, especially in restaurants where large quantities are required, it’s best to cook your stuffing separately and of course, try out all your most creative stuffing recipes. Tip #8: Don't Waste the Juices! Your guests will appreciate fresh turkey and giblet gravy. Save your drippings for easy and delicious "homemade" gravy. Be sure you do the math and know how many turkeys you will need to purchase for the number of people that you expect. Most food establishments can determine how many guests they are likely to be serving for the holiday each year. Use these numbers to calculate the number of turkeys you will need to purchase. A good rule of thumb is 1.5 pounds of turkey per person and a bit more if you serve buffet style. So, for example, to feed 200 people you'll need 300 pounds of turkey. Follow these tips and you'll have tasty turkey for your guests to enjoy throughout their Thanksgiving holidays.